They were promised foam waterfalls, rain tunnels, even snow – but the runners who signed up for this weekend's "Color Buzz" event in Melbourne may have been sold a lie. Concerns first emerged after those who paid up to $54 dollars to attend the fun run failed to receive any further information, or their promised t-shirts and goodie bags ahead of Saturday's event. 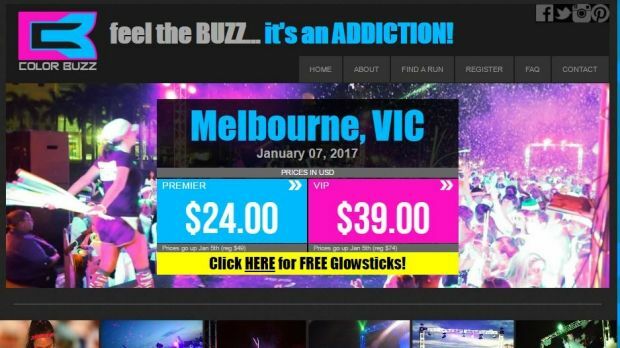 Emails to Color Buzz's organisers have not been returned, stoking fears that the event is a scam. Some ticket holders had received emails saying the fun run would be held at Flemington Racecourse, as are the legitimate but similarly-named "Colour Run" events. But on Wednesday a Victoria Racing Club spokeswoman said that there was no "Color Buzz" run booked at the course this weekend. Meanwhile, the same website has been associated with other scam event claims, including in Chicago in the United States. The Color Buzz website says that a portion of the ticket sales for each race is donated to charity. The Melbourne event purportedly gives money to the "Heart for the City", but no charity of that name appears to be registered in Australia. The website is still accepting bookings despite failing to provide the location of Saturday's event, and tickets are "available soon" for a run on February 25 in Sydney. Carmel Wharley, a retail manager from Berwick, booked tickets to attend the event back in November with a group of nine friends. They stand to lose more than $500. They paid $US39 for a VIP race package, said to include LED sunglasses, foam baton, LED ring, race bib and t-shirt. Ms Wharley said the website was extremely believable, with pictures of other races and a detailed booking process in which they were asked to pick a team name. Ms Wharley said she does not expect to see her money again. "I'm probably more annoyed than anything, because I was the one who suggested everyone do it. So I feel accountable" she said. "My 14-year-old daughter and a school friend were also going and they are really disappointed." Fairfax Media has attempted to contact Color Buzz organisers.